This custom Austin, Texas Fire Pit was made EXCLUSIVELY for Patio Comforts! Check out both sides of this unique fire pit in the images down below! 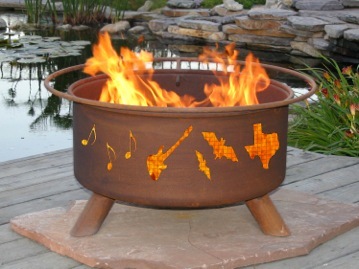 Everything is big in Texas and people love representing Austin with our Exclusive Austin, Texas Fire Pit! Whether you like to "keep it weird" or just love all that Austin has to offer....Get Fired Up with our Beautifully Crafted Fire Pit with a Never-Paint, Rust Patina finish. A great accent to any patio or backyard! The Austin, Texas Fire Pit is equipped with a barbeque grill essential for grilling out with friends. You won't find this fire pit anywhere else! A great addition to any backyard!